Moneybookers Withdrawal through Debit Card or Wire Transfer? 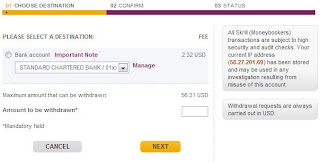 I have recently been working to figure out that how should I withdraw my funds from Skrill (Moneybookers) account in Pakistan that costs less charges. They have different charges for both methods. With debit card you will be charged 2.32 USD and for wire transfer they will charge you 1.8 EUR. I also took confirmation from them via email and support. If you wish to use the service I really recommend it. Its very convenient and economical than other methods that are available for receiving money from abroad in Pakistan. Luckily I have got verified my Standard Chartered Bank account and debit card as well on. For debit card or credit card verification you need to make a little deposit from 1-3 USD into your Skrill account by simply providing your card details. This deposit will remain into your account and you can withdraw it anytime but be aware that charges apply when you withdraw funds from your Moneybookers Skrill account. For account verification go to withdraw on the top right hand corner and hit withdraw button. You will be asked to add an account for verification purpose. All you need for this process is your account number and your bank swift code. Enter details when prompted and you are done. I recommend withdrawing money via bank transfer which cost you less amount of money 2.32 USD which is less than 1.80 EURO. So go ahead and enter desired amount you want to withdraw. Confirm your transaction and provide date of birth for verification. If you have any issue consider screenshots pasted and feel free to comment. Important Note: Withdrawals over 350 EUR to a non-primary bank account are subject to a higher fee of EUR 3.50. I recommend you to withdraw funds always to your primary bank account. Can we use it as an alternate to paypal? I want to use debit card for withdrawal should I go ahead? hope you reply soon. As per my correspondence with them following is what you need to know. Thank you for contacting Skrill (Moneybookers) Customer Support. Following up on your e-mail, we would like to kindly inform you that the available option for withdrawals for your country of residence is via bank wire transfer. However, be advised that you could not withdrawal funds to your credit/debit card. The usual time frame for the transaction to take place is between 2 and 5 business days, and the fee applied is 1.80 EUR. 2 days back I made my first Moneybookers withdrawal to my Standard Chartered Bank Account. Within a day i received a confirmation from Moneybookers that my transaction has been processed. However, the funds haven't shown up in my bank account as yet. Could you kindly guide? Shahzad Sb, You should at least allow it three business days as you can see the attached image I have also received it in within three days. 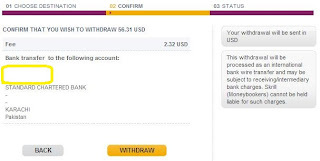 Can any body tell me how to withdraw money from LibertyReserves using SKRILL or some other safe Way.. I dont want any middle man or NetAgents to do this. Bank account add kartay waqt account no. dena parhega ya IBAN no. ? You should add bank account number! can we receive payments on our Skrill account from PayPal? Also mene apna Bank account aur Debit card dono link kerlia hai Standard bank ka.tou ab withdraw kse hoga? easily ho jayega from ATM? You can receive your payment from paypal to skrill account. You can also withdraw it from ATM easily! How to send money from Paypal to Skrill Account? Any Possibility? Which Bank you recommend for Moneybookers withdrawals? Because i heard that some bank don't have swift code so can't be added on Moneybookers? I can't afford SCB. Any other bank? its very easy, just follow instructions on paypal account. how many day required moneybookers to withdraw money to pakistan karachi bank al habib bank transfer please answer.! Pls help me or guide me correctly as i am new for online payment. I have made account on moneybookers / skrill and added my bank Alhabib Saving account details(swift and required codes) and followed all instructions. I didnt verify my address and account before. I have recieved 219 usd in moneybookers account. 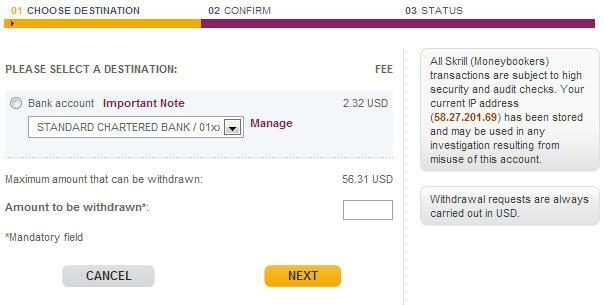 When i click for first withdraw with 219 usd(after deduction of skrill payment 2.33 its now 216.50 usd) they open identify verification required page which had few option and i choose Option 2: Verify your bank account (within 3 banking days) after clicking next i found such field If you have already received a bank account verification code, pls enter it here. Now i am worry for two questions. 1- will my saving account will work for it. 2- in many blogs they recoomend to witdraw first payment as 15 usd and i did it with 216 usd. pls confirm all going ok or i did mistake?? and how many time will bank take to get code? should i get it personally from bank?? i have trasferred money from odesk to my skrill account.when i add my account and provides swift code and IBAN number it says that your IBAN number is invalid.kindly guide me about this problem. contact your bank for valid IBAN, yes you can add debit card, ask HBL if they support such feature. In order to verify my bank account, skrill requires a 6 character code on the reference field of my bank statement. Can anyone help me on what this 6 character code is? Hi. In case you need any assitance regarding Skrill money withdrawal and uploads please consult us. We'll help you in the easiest and quickest way.